We live in a relationship-based market. Everyone is looking to find a new CRM strategy to development and nurture a brand’s external relationships. But what about the internal relationship? What about the workplace itself? Employee advocacy is a critical aspect of the brand humanization process. But how can we expect employees to be advocates if they themselves don’t feel that the brand is “human” in their day-to-day relationships. A successful brand is one that embraces H2H internally as well as externally. 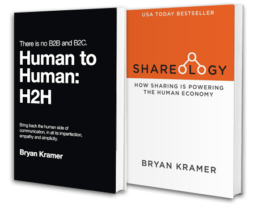 In this episode of H2HChat, Bryan and Suzie talk with Shawn Murphy, author of “The Optimistic Workplace: Creating an Environment that Energizes Everyone” about what it means to create a people-centric focused workplace as well as why it matters. In this conversation you’ll hear from Shawn about practical ways that you can influence the climate of your workplace and create meaningful change.